The Wizard has charged you with the quest to recover his Firestaff and restore order and balance to the world. You've carefully chosen your party of four mortal champions, armed them and trained them. Now it's time to enter the dungeon and face whatever may lie in wait for you on the path to your destiny! Last month we gave a brief overview of Dungeon Master, some tips on choosing a party of champions and hints on feeding them and training them in the skills they'll need to survive in the dungeon. We also presented some basic puzzle-solving hints. This month, we'll go over using magic, as well as some of the techniques you'll need to use in dealing with the hordes of nasty creatures that are just waiting for a tasty meal of champions for breakfast. We might as well start with the number one rule for encounters with monsters: Stay away from their mouths! Whether the monster attacks with a sword, with razor sharp teeth or bloodcurdling shrieks, the rule is the same. Except for a few monsters who can attack from a distance with fireballs and magic, they can't hurt you if they can't hit you! Even the most chivalrous of champions should not be above whacking the Dragon from behind, especially when the alternative is being roasted alive by his bad breath. Of course, your success in following this rule depends a great deal on how fast the monsters are and how much room you have to maneuver when you encounter them. Some creatures just seem to sit there and let you hack at them, while others are so fast that it will require good reflexes to get in a shot or two of your own. Even the slowest monsters will hit you though, so this brings us to the corollary to the number one rule: Don't just stand still and hack away! If you just go "toe to toe" with a creature, no matter how slow it is, you'll take a lot of unnecessary damage to your players. While it may not kill them, this damage must be repaired at the expense of time and magic. The time needed to heal an injured champion will also use up some of your finite food supply, so try to avoid getting anyone needlessly hurt. There are two ways of dealing with monsters that are especially successful. The first is what's become known as the "Dungeon Master Two-Step." This will only work in an area that's at least two by two spaces, not in a narrow corridor. Essentially what you do is move sideways and turn quickly to face the creature from its side. You hack away until it turns around to face you again, and then you repeat the maneuver. Most of the monsters in the dungeon can be handled this way, from the Purple Worms to the Dragon. It requires a little practice to get the rhythm right, and you should use the keyboard cursor arrow keys to do the moving. The keyboard is faster than trying to click on the movement arrows on the screen with the mouse, and it also allows you to get your weapon ready with the mouse while you're turning to face the monster with the keys. Most importantly, this method keeps you out of the danger area in front of the monster's mouth. The other fighting method is what might be called the "Strategic Retreat." This is especially effective with the slower monsters, like the "Rockpiles" or "Rock Squids," as some call them, and has the advantage of working in narrow corridors. Before trying this, be sure that you have a fairly long, clear corridor behind you. You definitely don't want to back up into another monster or a dead end! Facing the creature from one move away, ready your weapon with the mouse. Then using the cursor keys on the keyboard, quickly move forward, hit the monster, and then move back away before the monster can hit you. Eventually the monster will move forward toward you, so you'll need to retreat a step from it. 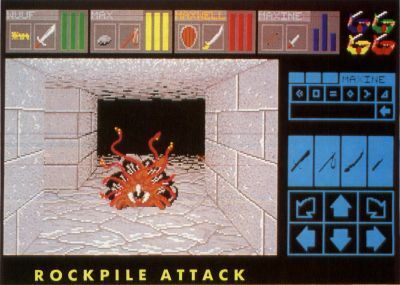 Repeat the attack, moving up, hitting, and moving back, backing down the corridor until the creature is killed. You may end up backtracking a bit using this method, but again, it keeps you away from the monster's mouth for the most part, while still letting you attack. You'll probably still take some hits from the creature, but they'll be far fewer than if you just stood there hacking away at each other. With any fighting method, and with most of the monsters you'll encounter, you should try to make the most of the opportunities you'll have to hit the monsters at a distance In other words, throw whatever you might have handy at them! The more throwing or shooting experience your champions get, the more they'll advance in ninja levels, which determines their skills with these "range weapons." This is why it's very important to have everyone in the party, but especially the two in the back, throw whatever they can, whenever they can for practice. While it might seem to slow things down, it's good to set one of the champions in back to be leader and have them throw old Scrolls, burnt out torches, items of clothing or anything else that's handy, out in front of the party as they move down the corridors. Their ninja levels will advance fairly quickly, which will help greatly during encounters with monsters. As the one doing the throwing tires, and as their stamina begins to drop, you can trade off the throwing duties with another character by making them the leader. In the beginning of the game, while your magic users' skills are still fairly undeveloped, you can have the front two champions ready their swords or axes, while the rear two have throwing stars or daggers ready to throw. Even arrows can be thrown and will inflict damage on the monsters. Every bit of damage you can cause before the monster gets into range to hit you means just that much less chance of your party being injured. You can throw boots and shields, and even screamer slices at the creatures. In fact, it's rather satisfying to kill a Screamer by throwing screamer slices at it! Once a battle is over, be sure to go around and collect your thrown weapons. Sometimes you may throw a weapon at a creature, and it will stick in it, so that when the creature is finally killed, that weapon will fall to the floor there Don't overlook a grey throwing star on the grey floor! That brings up another hint: Listen carefully when a monster is killed. You may hear the telltale clink of an object hitting the floor. Some creatures may be carrying things that you might find useful, like coins or keys. Don't overlook the slightest detail! Ironically, killing the Rock Monsters will provide you with small rocks that you can use as weapons, either throwing them by hand, or as ammunition for the sling that you will find. The correct way to use a weapon like a sling or a bow, which requires a separate supply of ammunition, is to hold the weapon in the Champion's "action" hand, and hold a rock or an arrow in the other hand. The rest of your ammunition should be put in the "quiver" on that character's inventory screen, and the weapon will be reloaded automatically as it is fired. There shouldn't be any other items in the quiver because they may interfere with the automatic reloading. This brings up two important facts. The first is that a champion can only fire five shots before you have to manually reload the quiver, and secondly, that character can't hold anything else, like a torch, in his hands while he is using this kind of weapon. Sometimes during a fight, especially if you are doing a lot of maneuvering around a monster, you may find a weapon that you had thrown before. Don't hesitate to grab it and throw it again. Every little bit helps, or in this case, hurts! There will come a time when your magic users' skills have advanced to the point where their fireball and lightning spells are more effective than throwing stones at the monsters, so don't be afraid to discard a weapon when its usefulness seems to be diminishing. Throwing rocks or daggers at Mummies or Screamers on the first few levels can be quite effective, but will hardly be noticed by the Giant Rats or Scorpions several levels down. As you progress, you'll find weapons that are much more effective than the ones you are carrying. Replace the throwing stars and sling with crossbows and speedbows as you encounter them. Try to keep your character's loads as light as possible by carrying only the most effective weapons. 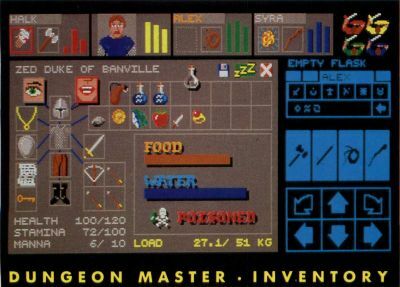 With only a few exceptions, the weapons in Dungeon Master don't wear out or get broken, so you don't have to worry about carrying spares. When you find an item in the dungeon, take the time to examine it carefully. Some things may have offensive or defensive properties which may not be immediately obvious. By holding an object in a character's action hand, you'll be able to see from the Action menu whether that object has any of these properties. A blank space in the position that normally shows the player's weapon means the item is useless as a weapon. A loaf of bread, for example, wouldn't do you much good in a fight, but something which does have useful properties will show up as an icon in the Action menu. By clicking on this icon, you'll be able to see what powers the item has. If you do find special weapons or magical items, be careful not to waste them, as these kinds of things usually have a limited number of uses, and they may come in handy later on when the monsters begin to get really nasty! You should be aware that every time you swing a weapon, or cast a spell, it will take a certain amount of time for your characters to recover from the effort. As they improve their skills with weapons, more options will become available to them; for example, they can swing, chop or melee with some weapons. Swinging a sword is not as effective as chopping, while the almost uncontrolled attack of a melee is even more effective against a monster. However, it takes a lot longer to recover from a melee attack, during which time that character can't do anything at all. You'll find that it may be better to simply chop at the monsters repeatedly. Watch the number that shows how many points of damage your attack is doing to the monster, and use that to help you decide whether or not to use the highest level attack. Also be aware that the effect of an attack is determined not only by the type of weapon, but by the strength and dexterity of your character. This is another reason to keep practicing for ninja levels, as they help increase your dexterity. Another thing to watch is the time it takes to recover from casting a magical spell. If one of your party casts a fireball spell for example, he'll have to rest for a while before he can take up a weapon and join in the fight. For that reason, it may be best to have only the back two champions casting magical spells, while the front two have their weapons at the ready. There's nothing worse than having your people getting hit by monsters while they're powerless to do anything to defend themselves. One thing in the dungeon which may not look like a weapon, but which can be immensely useful is the typical, ordinary door. Not only are the doors useful to hide behind while your characters regain their health and magical mana, but they can also be closed on a monster's head (or whatever), causing them damage. 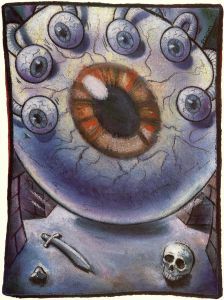 Most of the monsters are fast enough, and smart enough, to move out from under the doors after being hit once or twice, but the added damage may be enough to make a difference in killing them. Most of them will also come back for more, so you can stand next to an open door and keep closing it on the monster while you hit it with your weapons and magic. This works extremely well against the slow moving Rockpile Monsters, which can't move out from under the door very quickly. Unfortunately, killing a creature with a door doesn't advance any of your character's skills, but on the other hand, it just might keep them alive. Be careful when you're using a door as a weapon if you're also hacking away with an axe or a sword. If the door closes just as you're swinging the weapon in your hand, you may shatter the door, and suddenly come face to face with the monster behind it! Some monsters may not be stopped by a door and cannot be hit with your normal weapons. These "Non-material Beings" need to be handled either with magic or with special weapons. You'll find a scroll which gives a spell to weaken them, which may be enough to kill them by itself. Also, the "dispell" function of some wands and staffs can be used against them effectively. Probably the most effective weapon though, is the Vorpal blade. This unusual-looking sword can be found on the Riddle room level. There are two of these weapons, but one of them is hidden extremely well. It is in a hidden corridor which is opened with a wall switch, but the switch itself is hidden by something that is so ordinary looking that by this time you've probably stopped investigating them. The Vorpal blade is not very effective when used against a normal monster, but don't make the mistake of discarding it. You'll need at least one of them later on. Because of its magical properties, using the Vorpal blade will give you wizard level experience too. In some areas, further down in the dungeon, you may find it helpful to hold normal weapons in your front two champions' action hands and keep the Vorpal blades in their other hands so that you can make a fast change of weapons without having to go to each character's inventory screen. 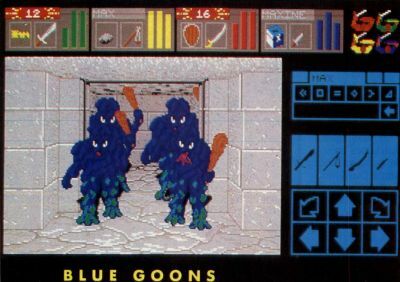 The game speeds up when it doesn't have to display the animated graphics of the normal view, and the monsters can hit you several times while you're choosing a different weapon. You can also have the champions in the back row hold weapons for the other characters in their ready hands. When fighting particularly nasty monsters deep in the dungeon, another tactic is to keep healing potions in the character's free hands. That way you can quickly grab one on the main screen, hit the function key which corresponds to the player who's in trouble, and have them gulp the potion down, while still in a fight. Again, going to the inventory screen will give the monsters a chance to get in a few extra hits, so be careful how you use this technique. It's good to try to quickly retreat a few steps before you switch screens to give you a little extra time. One important thing to remember is that you don't have to kill every monster in the dungeon to win the game. There are a few creatures which have items that you can use, but in most cases it won't matter if you duck down a flight of stairs without standing and fighting every last monster on a level. In fact, there are places in the dungeon where the best course of action is to simply lighten your load and run past the monsters until you get to a more defensible position and can rest and heal your party. Of course, not all fighting is done with material weapons. A low-level, beginning wizard may not be able to do much with his magical powers other than keeping the corridors well-lit, but with practice will come the power to do more spectacular things. Throwing fire and lightning at monsters is a lot more effective than throwing daggers and arrows. Your fighters' strength and agility with weapons will serve you well in the beginning of the game, but it's your characters' wizardly abilities which will get you through most of the end of the game. This is why perhaps the most important training for your champions is in these magical abilities. Each of the champions has a certain maximum amount of magical mana power. This maximum can be increased through the practicing of magic spells. Every time you cast a spell, whether or not it is successful, you are given credit for trying. When you achieve the next wizard or priest level, your mana maximum goes up. If you don't keep your characters busy casting spells though, even when it doesn't appear to be necessary, they won't advance to the levels where they can do some real damage to the monsters when it's needed. If you notice that a character's mana has reached its maximum, have them cast a light spell, even if it's light already. Not only will this extend the amount of time that the dungeon stays lit, but it will give them a small amount of experience toward their next wizard level. It will reduce their total mana too, allowing them to accumulate more. There's nothing quite so wasteful of magic as not using it! A wizard or priest who walks around fully charged to the maximum with mana will not be gaining any experience. On the other hand, don't deplete your wizards' mana too much, unless you're reasonably sure you won't need it around the next turn. Cast just enough magic to keep them below the maximum, but do it consistently. If you try to cast a spell which requires more experience than your players have, the spell isn't likely to work, but they will get credit for trying. Don't try to have your lower-level wizards try to throw top-level fireballs, though, even if they have enough mana to create the spell, if you're hoping to use it in battle. You'll probably end up staring into the mouth of a hungry monster, while your spell goes "fizzle." Stay with the power levels that you know your wizards can handle, but experiment once in a while with higher ones so that you'll know when you can start using them regularly. One tip that will allow you to effectively increase the maximum amount of mana that any of the characters has, is to create a spell that you know you're going to need, such as Light or a Fireball, when you have enough mana for that spell. Then you can "hold" that spell while your mana recovers, so that you end up with your maximum mana, plus the magic in the spell you're holding. This is especially effective when you have your party sleep. Before you put them to sleep, have them create a light spell, and then when they wake up with their mana at a maximum, you'll have light spells ready to go, without costing any of your newly aquired mana! Like all of the abilities in Dungeon Master, any character can achieve wizard or priest levels, even if they don't start out with any. All it takes is a little bit of mana, enough to create a weak spell like light. By casting this weak spell over and over, eventually even the most burly fighter can become an experienced Wizard. If the character has too little mana to create a spell all at once, just create the symbols that they can; then they can "hold" those symbols until their mana recovers enough to cast the rest of the symbols. It can be a long process, but it's worth it in the long run. What about those characters who start out with no mana at all, though? It takes mana to cast spells in order to get more mana. There are a few champions who start the game with zero mana, and some whose mana is so low that they can barely cast the lowest power symbols. Even these players can gain magical experience, although it'll take more effort on your part. There is a spell which will create a potion to give a character greater mana, but the problem with this is that the amount of mana it costs one character is greater than the amount of mana it will give another character. Also, this is a fairly high-level spell, and the scroll which tells how to cast it isn't found until later in the dungeon. Even this would be worthwhile to do, though, if it was the only way to give poor dumb Halk enough mana to get him started with magic. Fortunately, there's another way that works quite well. Some of the magical items you'll find in the dungeon will give the champion who holds them a little bit of mana or a slight increase in the mana they already have. When you put something which appears magical into a character's action hand, watch their mana statistic to see if it goes up. Use that little bit of mana to create a weak light spell, and that Champion is on the way to gaining mana of his own. The only problem with this method is that going into battle holding a tiny little wand in your hand could end up being fatal! Be sure to exchange the magical item for a weapon before you fight anything; then go back to your program of "remedial magical" education. One word of warning about using magic to create fireballs. Be careful not to cast a fireball while you're facing directly into a wall. It'll be reflected back onto you and roast your party! However stupid it may sound, there really is a use for this seemingly senseless bit of self-destruction. If most of your party gets wiped out and you just want to start over from the point at which you last saved the game, you don't have to re-boot the game, and wait through the entire loading process. Simply turn to face the wall, and throw a fireball at it. You'll kill off the remaining members of the party and be presented with the option to reload your saved game. Restarting is a lot faster this way. You'll find that your reliance on magic increases as you travel farther down into the dungeon; but even so, there'll be many times when magic must be aided by good old hand-to-hand combat. Even the greatest wizard can only do so much with magic before he has to rest, and if that happens before you've eliminated all the monsters in the area, your fighters will have to draw their weapons and prepare to defend the party. So practice your magic and fighting skills. Next month we'll take a guided tour of the dungeon, with side trips to some of the more interesting (and puzzling) puzzles, and introduce you to the denizens of the dungeon.